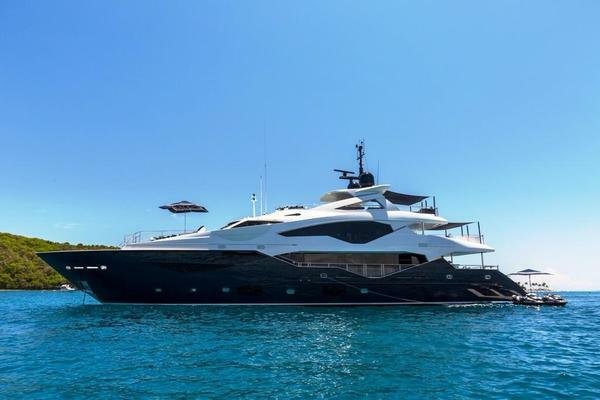 MUCHOS MAS presents a unique opportunity to own a recent delivery with beautiful contemporary design that has already proven her wide appeal on the charter market. Built by the experienced craftsmen at Crescent Custom Yachts in Canada, MUCHOS MAS features an elegant profile that is further enhanced by eye-catching stardust metallic silver paint on her hull. The contemporary interior is an elegant blend of rich walnut burl panels, grey vinyl tweed wall coverings, and rift sawn white oak flooring. This fusion of materials creates a relaxing interior that accommodates 10/11 guests across five spacious and well-appointed cabins. The owner’s stateroom is truly stunning with an office leading into the full beam suite that features smart glass privacy windows and a massive 2-person Vichy shower with six shower heads and four adjustable modes. There are four spacious cabins on the lower deck. If desired the aft guest cabins can easily transform into a full beam VIP suite with private sitting room. Much like her stunning interior spaces, MUCHOS MAS features unparalleled outdoor areas for relaxing and entertaining. There is a seated bar within the main saloon opening to the aft deck that allows for guests to enjoy the bar both indoors and out. There are further dining and relaxing options on the aft deck, the bridge deck, and the bridge deck forward. The sensational sun deck is arguably the finest part of an already excellent yacht. It boasts a bar, BBQ, day head, large sun pad forward, two water vapor misting systems for hot days, and a unique corner jacuzzi forward with 54 jets and a swim-up bar. 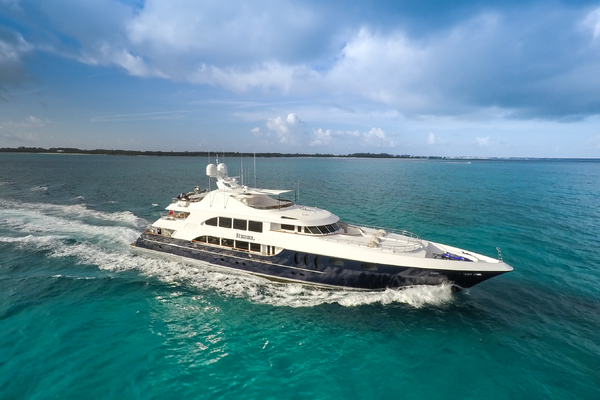 MUCHOS MAS is truly unparalleled in her class as a feature packed charter yacht, recently delivered, and ready for use by her new owners from day one. See her on display with Burgess at the Cannes and Monaco shows.